100% Precision CNC machined from 7075 aircraft grade aluminum alloy, you cannot buy a better sprocket. 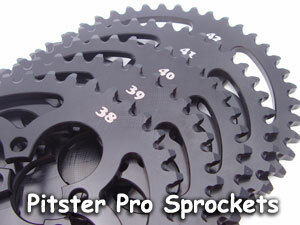 Our Pitster Pro pitbike sprockets are exactly the same aircraft aluminum as our big bike sprockets. They are machined to the exact same high tolerences as well. The key to a long lasting sprocket is the fit where each of the chain rollers fit into the teeth of the sprocket. Unlike stamped or cut sprockets, our fully CNC machined design insures a perfect fit between the chain and the sprocket, as well as the highest quality finish.